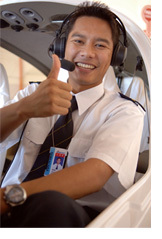 HMA offers our cadet pilots a range of aviation courses. All our courses are approved by the Malaysian Department of Civil Aviation (DCA) in accordance with the International Civil Aviation Organisation (ICAO) requirements. The Licence examinations are conducted by the Malaysian DCA and United Kingdom Civil Aviation Authority International (UK CAAI). Courses cater for, cadets who are sponsored by commercial airline companies, private cadets fresh out of secondary school, overseas cadets as well as adults who meet the qualifying requirements. Our course duration ranges three (3) to eighteen (18) months.